This article traces the origins of the mannequin and challenges the gender assumptions it has been cloaked in. In nineteenth-century Paris, the fashion mannequin became a key technology in the construction of normative bodies, a principal “actor” in shaping current clothing cultures, and literally embodied debates over creativity and commodification. It locates the origins of the mannequin and the advent of live male fashion models in the bespoke tailoring practices of the 1820s, several decades before the female fashion model appeared on the scene. It ties the mannequin to larger shifts in the mass-production, standardization, and literal dehumanization of clothing production and consumption. As male tailors were put out of business by the proliferation of mass-produced clothing in standardized sizes, innovators like Alexis Lavigne and his daughter Alice Guerre-Lavigne made, marketed, and mass-produced feminized mannequins and taught tailoring techniques to and for a new generation of women. Starting in the 1870s and 80s, seamstresses used these new workshop tools to construct and drape innovative garments. Despite the vilification of the mannequin as a cipher for the superficiality and lack of individuality of fashionable displays in the modern urban landscape, early twentieth-century couturières like Callot Soeurs and Madeleine Vionnet ultimately used mannequins to produce genuinely creative clothing that freed the elite female body and allowed it new forms of mobility. Like garments, academic articles are largely produced “backstage” and the labour that goes into them is equally unseen. I am thrilled to finally share this essay free of charge to readers and to let it go, but it is important to me to acknowledge the hands, hearts, and minds that have been involved in its extended genesis and début on the public stage. I feel it is important to place “Body Doubles” in the context of the histories of my evolution as a scholar, the field of Fashion Studies, and of the launch of the inaugural issue of our journal. “Body Doubles” was originally a chapter of my doctoral dissertation, which I completed in 2002. I would not write the same article today, nor would I now have the time to do quite the amount of archival and actual sleuthing it required. However, I have continually updated it to reflect the expanding literature in our field, and I do feel it draws on the unique richness of approaches and frameworks at our disposal as scholars of fashion. The research process involved everything from systematic digital searches for the word mannequin in French literary sources (in the relative infancy of such technologies), close readings of obscure images I unearthed in the Cabinet des Estampes at the Bibliothèque Nationale in Paris that form part of my art historical training, as well as talking to an eighty-year-old tailor in Paris and kinetically experiencing the actual studio environments and techniques of making clothing in the setting of a French fashion school. In terms of theoretical frameworks, I began with a Marxist-feminist approach and have attempted to incorporate, so to speak, some of the possibilities offered by Actor-Network Theory (ANT), if only in a preliminary manner. A peer-reviewer asked me early on whether the mannequin was an object or an idea. I can now say with conviction that it is both, and more. In reflecting on the process of working on the mannequin, an object that literally embodies dehumanization, I concluded that my labour on it, if often angst-ridden, has been anything but alienating. In fact, working on the mannequin’s inanimate form has allowed me meet and establish strong intellectual and emotional ties to so many people and places that I’ve become more sentimentally attached to this article than any other. I am reluctant to let go of this “actor” in my life. As a student, this work helped me grasp the mechanics of tailoring and pattern drafting when I took a summer course at the Parisian École supérieure des arts et techniques de la mode (ESMOD), the school founded in 1841 by tailor Alexis Lavigne. For my research, I was determined to access Lavigne’s papers in ESMOD’s archives, but in order to do so I had to formally enroll as a fashion student and learn his techniques, which have been passed down for over a century. It was a humbling but illuminating experience. When it left the workshop, this research helped me get my first job. Professor Christopher Breward encouraged me to present “Body Doubles” at a conference at the London College of Fashion. I wish to express my gratitude to him — his book on the Hidden Consumer was a lifeline during my doctoral work. At that conference I met Professor Caroline Evans, a fellow mannequin scholar, who became a true friend and mentor. This article is dedicated to her. I also made Barbara Burman’s acquaintance, and she was instrumental in setting me on the track towards my first paid position at the Winchester School of Art in 2002. Barbara, along with Lesley Miller and Judith Attfield, were ideal mentors who revealed the manifold possibilities of the History of Dress and Textiles to me. I also want to thank Professor Valerie Steele, whose work has legitimated the field and who famously launched the journal Fashion Theory in 1997, just as I was writing my dissertation proposal. My thesis advisor Professor Michael Marrinan gave me essential critical feedback, and Audrey Colphon, our fashion technician at Ryerson School of Fashion, patiently helped explain the utility of mannequins for draping in the studio. I also want to thank the graduate students in Ryerson’s MA Fashion program, as well as the wonderful anonymous peer-reviewers (and many friends) who gave me such helpful suggestions for improving it over the years. I’ve done my best. The mannequin helped me on my journey from being a lonely graduate student in Art History with a love for dress and material culture to an interdisciplinary scholar able to collaborate and co-edit a new journal in the field with my friend and fellow idealist Dr. Ben Barry and an incredible international editorial board. I have learned so much from my pioneering mentors in the field of Fashion Studies and the generosity of my community of scholars, creative practitioners, and students. Thank you all. Parisian dolls enchanted Walter Benjamin, who called them the “true fairies” of the arcades.1 In the nineteenth century, the artisans and entrepreneurs of Paris garnered a worldwide reputation for their skill in producing an astonishing, beguiling, and sometimes disturbing range of humanoid figures. Some of these bodies became children’s playthings, but professional artists had their own life-sized, often jointed “dolls.” Painters posed and dressed these pliable and pliant tools called mannequins in service of their art. Tailors and then dressmakers, who also required docile bodies, quickly adopted these useful mannequins. While the English language has specific terms to differentiate between these diverse figures, the French word mannequin designates artists’, tailors’, and dressmakers’ dummies as well as the live, professional fashion model. Miniature, articulated wooden people called lay-figures in English still help artists draw and paint as fashion students and designers drape and construct garments on “tailor’s dummies” or “dress forms” behind the closed doors of their studios, while their more visible brothers and sisters animate every boutique and department store in the cast-resin guise of the shop window dummy.2 Finally, the word mannequin was and is still used to designate the live fashion model, that idealized and often emaciated figure who struts across the catwalk and scrolls down the screens of social media feeds. As the use of one word for these multiple animate and inanimate bodies suggests, the French mannequin is a shape-shifter, who blurs the boundaries between death and life, female and male, and continues to populate the spaces of labour and commerce. Yet despite the starring role mannequins continue to play in the making and selling of clothing, their history in the fashion industry is less than two hundred years old. This article attempts to trace the origins of the fashion mannequin and to challenge the gender assumptions it has been cloaked in. The mannequin was a key technology in the construction of normative bodies, a principal “actor” in shaping current clothing cultures, and literally embodied contests over creativity and commodification in nineteenth-century Paris. Before embarking on a study of the nineteenth century, a short prehistory places the mannequin in context. The first and only known fashion “dolls” were female, and their role in Early Modern fashion production and dissemination still requires elucidation.10 Art historians have managed to paint a clearer picture of androgynous or masculine mannequins as artists’ “silent partners.”11 By the early fifteenth century, mannequins are documented as “common tools” in artistic practice.12 The word mannequin comes from the Middle Dutch, mannekijn or “little man.”13 These small-scale, three-dimensional, abstract, and often articulated representations of male or androgynous human bodies were ideal clotheshorses for draping and rendering fabric.14 Like fashion dolls, the origins of these body doubles are difficult to document. By 1694, the word had entered the dictionary of the Académie française and by the eve of the French Revolution, life-sized, articulated mannequins were fairly widespread.16 Few of these objects still exist, but a small-scale mannequin hand-crafted in the 1740s by the French sculptor Roubiliac and accompanied by an elite male and working-class female wardrobe (ca. 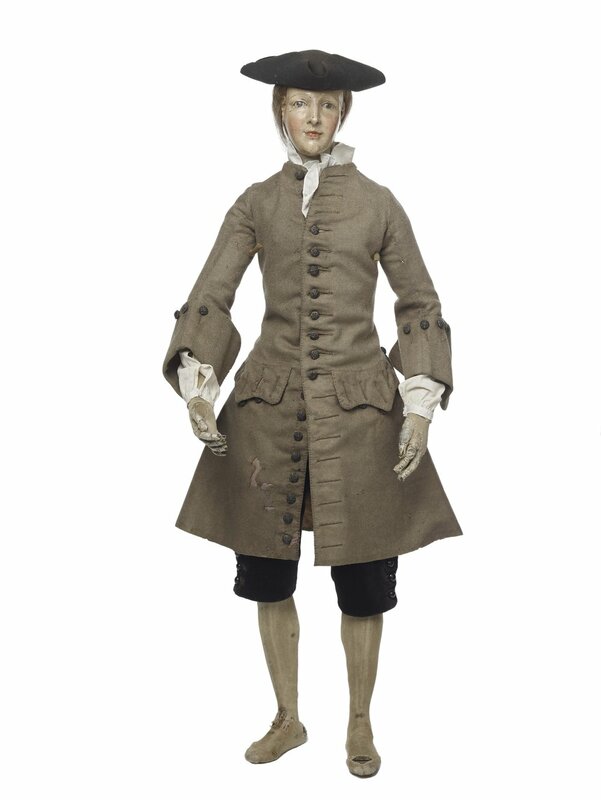 1750–62) survives in the collections of the Museum of London.17 The high quality of its construction and dress are evident in details like the wig crafted of human hair and the fingers, which are poseable and individually articulated . François Roubiliac, Articulated Artist’s Lay-Figure, Front and Back view, ca. 1740. Skeleton of bronze overlaid with cork, horsehair, wool, and an outer covering of silk stockinette, with a carved wooden and painted head. 76 cms. © Museum of London. By the mid-eighteenth century, the French had become the most prominent makers of luxury, life-sized, articulated padded mannequins perfectionnés, complete with silk cloth “flesh” coverings and realistic painted papier-mâché faces.18 These three-dimensional, poseable bodies could replace costly live models or wealthy sitters, obviating the need for clients to come in for lengthy posing sessions. Artists continued to use full-scale mannequins, but the nineteenth century saw this object’s relocation from the painter’s studio to the tailor’s workshop. As with the lay-figure, the exact origins of the mannequin as tailor’s dummy are difficult to trace, but tailors seem to have used it to both make and sell clothing starting in the late 1820s. While the exact moment and means of this transition from artist’s to tailor’s atelier is not clear, the elite worlds of art, literature, and fashion constantly overlapped in early nineteenth-century Paris.19 Artists like Horace Vernet and Paul Gavarni drew fashion plates, while the best tailors, including Staub and Kleber, were considered “sculptors.” The word “chic,” which sounds like the scrawl of an artist’s pencil or the slice of a tailor’s shears, originated in the early nineteenth century as artists’ slang for an artificial but superficially elegant way of drawing and was soon applied to those who sported a dashing, tailored “look.”20 The marketing of fashion and art had much in common. As Robyn Roslak argues, many Parisian artists “produced their canvases for sale in the open marketplace,” were paid by the piece, and “supplied the few with luxury.”21 The nineteenth century saw the same shift from bespoke tailoring for the wealthy few towards suits made in advance for the open market, transforming many men’s subjective and embodied experiences of dress and dressing. Extravagantly decorated, colourful elite men’s dress in the Ancien Régime transitioned into the severe, black bourgeois suit of the later nineteenth century. The emphasis of nineteenth-century tailors was on perfect cut and fit: they literally sculpted their clients’ bodies with woollen broadcloth, steaming the fabric and shaping it with buckram linings to mould it perfectly to the male form. In order to create what Anne Hollander calls these “heroes in wool,”22 the human body had to be measured with meticulous precision. In previous centuries, exact measurement had been reserved for expensive cloth; tailors simply cut notches in pieces of paper to mark the bodily dimensions of each individual client. The final garment was then adjusted on the client’s body during several fitting sessions. After the French Revolution, the newly invented metric system or mètre révolutionnaire attempted to replace the bodycentric, highly regionalized, and aristocratic Ancien Régime system that included measurements like pouces or thumbs (inches in the Imperial system), used the “pied du Roi” or “King’s foot’ as a standard, and allowed local nobles to set their own measures for tithes of taxable goods. Postrevolutionary scientists attempted to make measurement a more rational, universal, and “democratic” process with the decimal system.24 In his comprehensive article on standardizing nineteenth-century French bodies and clothing in “industrial sizes,” Manuel Charpy describes how quickly this mathematical turn influenced tailoring systems and practices.25 During the first half of the nineteenth century, master tailors vied with each other in their patenting of measuring apparatuses and their publication of new geometric cutting methods. They produced instruments like Beck’s costumomètre (1819), Sylvestre’s corsage mécanique (1829), and Delas’ somatomètre or body-metre (1839).26 Mathematical abstraction became the norm in clothing construction, as flat pattern drafting and “geometrical” tailoring techniques began to take over from embodied, intimate interactions and traditional methods of draping cloth directly on the body of the client. It was difficult to transfer complex garments made from two-dimensional patterns onto three-dimensional bodies without making errors. As suit jackets became increasingly complex in cut and construction in the early nineteenth century, the mannequin became an essential working tool. In the art world, mannequins helped artists translate the three-dimensional, clothed bodies of their sitters onto the flat, two-dimensional surface of the canvas. 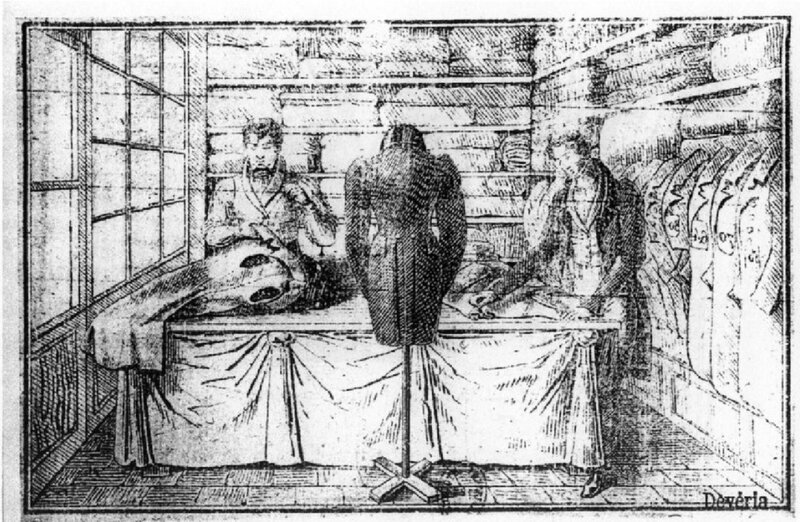 Tailor’s dummies were rarely illustrated because they were functional tools used in the relative secrecy of the tailor’s workshop. The earliest depiction I have found of a mannequin in use suggests that it was linked to the production of ready-made clothing. Based on the cut of the suits in the image, the anonymous pen and ink drawing dates to circa 1826–9 and shows two tailors absorbed in their work . A tailor’s dummy in the workshop, ca. 1826–9. Pen and ink. Paris: Cabinet des Estampes, Bibliothèque Nationale de France. Bolts of cloth line the walls of a room illuminated by one large window on the left. The standing tailor on the right cuts out cloth from one of these bolts, while his companion, whose knees are mostly concealed under the still sleeveless jacket draped over them, plies his needle, pad-stitching lapels. This tailor sits on his workbench, hunched over in a traditional cross-legged position still called en tailleur in French. Both tailors are stylishly dressed and coiffed, as one would expect of fashion professionals. A dummy dressed in a form-fitting jacket presides somewhat imperiously over their work. The headless but seemingly embodied garment occupies the centre of the image, where it “stands” with its back to us. Presumably it is being used as a three-dimensional visual template for the tailors or to check the fit and hang of the finished garment. There is a row of completed frock and cutaway coats strangely floating on the right with numbers pinned to them, suggesting several possibilities. Perhaps these are garments made in standardized sizes for anonymous customers, rather than pieces that were bespoke or “spoken for” by individual clients, or they could be order numbers for individual clients, who may have designated numerically rather than by name, providing us with an idea of the scale of the operation. While at first glance this piece seems to be a promotional blurb, professional journals like this one provide ambivalent accounts of the actual usefulness of the stiff, abstracted, “mechanical” body of the tailor’s dummy, which could not adequately reproduce the constantly mobile and yielding flesh and varying postures of the “real” body of the client. Regardless of its shortcomings, by mid-century it had joined shears, paper patterns, and the tape measure as an essential tool in the workshop of the tailor and the clothing entrepreneur. As the 1820s dummy “supervising” workers and the “spring mounted” apparatus of the 1830s suggest, the mannequin was not merely an inert thing — it wielded a power of its own over human actors. In actor-network theory (ANT), which aims to dissolve the boundaries between human and non-human “actors,” mannequins become part of an “assemblage” in the tailor’s workroom and “actively construct and perform the world they apparently describe.”31 ANT, which originally used an ethnographic methodology to analyze how forms of knowledge were constructed by the tools and scientists in a laboratory setting, could equally apply to the relationships produced by and through the tailor’s workshop, tools, mannequins, and customers. Though it is not often applied to fashion history, ANT shows potential in exploring exactly how often overlooked objects like mannequins worked as a technology in the garment industry. In Jane Bennett’s words, an actor “is that which does something, has sufficient coherence to perform actions, produce effects, and alter situations.” The mannequin changed the way cloth and humans interacted with the body through a normative and standardized intermediary, altering or sometimes even replacing the fleshly and personalized interaction between tailor or dressmaker and individual client. As the 1820s drawing implies, the mannequin’s body now humorously seems to be “directing operations,” producing two glaring absences in the assemblages typical of earlier tailoring practice.